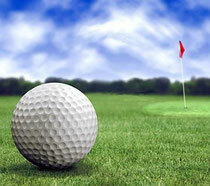 On August 18, 2012, ten Fathers and Sons joined in the Breakfast and Golf event held at Rolling Turf Golf Course. We were blessed with a beautiful day yet some soggy course conditions but nevertheless it was a lot of fun ... especially celebrating Jay's golf ball that sat on the lip of the cup for a good 10 seconds before dropping in! Amazing!